You will want to visit Padlock Craftsman to see additional Figural & Artistic locks. Arabic. 5 1/8" high x 11 5/8" wide x 1 1/8" deep. Weight: 3 pounds. Iron. Gold inlay, and silver inlay on outside edges. 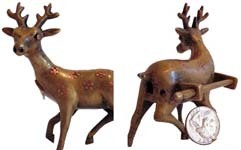 Mfg by: Arabic manufacture, probably second half of 19th c. to first half 20th c.
Deer. Mfg by: Chinese manufacture. Bidri. 5" high x 3" wide x 1 1/2" deep. Steel construction. Silver and brass decorative inlay. Late 20th c. This lock requires 3 keys to progressively release the shackle. Mfg by: India manufacture. Bird. Iron construction. Mfg by: South India. Chicken. Brass construction. Mfg by: South India. Human Figure. 3 15/16" high. Weigth: 7.4ozs. Bronze construction. Barbed spring mechanism. The turban is hinged, when you lift it up the keyway is exposed. Early 18th c. Mfg by: Western Rajasthan, India. Indian. 2 1/2" high x 3" wide. Steel case. Steel shackle. Silver decorative inlay. Late 20th c. Mfg by: India manufacture. Lion. Brass construction Mfg by: South India. Padlock. Overall length: 13 3/4". Iron construction. Original paint. 3 keys are required to open the lock. Small key for the front "door", "nail" key for half release, then the long push key to release the shackle. 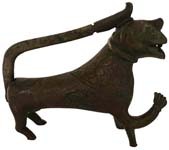 Early 18th c. Mfg by: IKerala , South India. Scorpion. Overall length including tail: 5 1/2". Weight: 4.5oz. Brass construction. The tail is hinged, when you lift it up the keyway is exposed. Early 18th c. Mfg by: Jaisalmer, Rajasthan, India. Lion. Bronze construction. 3 1/2" high x 5" wide. Weight: 1lb 1.6oz. The keyway is on the chest. A very lite weight wax casting. 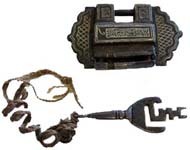 The tiny hole on the ear and the hole on the forehead indicate that it is a trick lock.The shackle is missing for this lock. 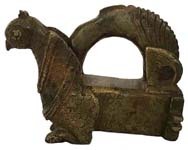 Early 17th c. Mfg by: Southern India. Japanese Cabinet Lock. 2" high x 6 1/2" wide. High copper content brass case. High copper content brass shackle. The key is old but not original. Compressed spring mecanism in very typical Edo period shape. Overall "Fire Gilt" finish using mercury and gold. Mfg by: Japanese manufacture, Edo period, circa 1800. This is a VERY scarce lock. Shrimp. 1 1/4" high x 3 1/2" wide. Steel construction. Superb and startling detail, very fine decorative silver inlay, the work of a master. 19th c. Mfg by: Possibly Korean or Japanese manufacture. Persian. 2" high x 3" wide x 1/2" deep. Steel case. Steel shackle. Gold decorative inlay. Late 20th c. There are two keys, one to open the secret compartment, and the other to release the shackle. Mfg by: Persia manufacture. Horse. 5/8" high x 2 3/4" wide x 3/8" deep. Bronze. 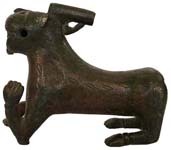 Zoomorphic stylized horse, typical of the period, with bird form on shackle bar. Decorated with incised lines and dot and whorl motifs. The (absent) slide key, inserted in the front, would have released springs on either side of the remaining interior bar, freeing the shackle; however, all iron has corroded away. Damage to right hind leg. Mfg by: Roman, Byzantine, 11th-12th century. Barrel Lock. 3 1/4" high x 3 1/4" wide. All iron construction. Barbed spring mechanism. I picked the lock to expose the plug. The scrolled shackle is the key to its origin. Mfg by: Sweden, 17th-18th century. Tibetan. 1 1/2" high x 1 1/4" wide. Copper case. Steel shackle. Unusual small size. late 19th c. to early 20th c. Mfg by: Tibet manufacture. Tibetan. 3" high x 4" wide. Steel case. Steel shackle. Silver inlaid decoration. 19th c. Mfg by: Tibet manufacture. Tibetan. 1 1/2" high x 2 3/4" wide. Steel case. Steel shackle. Silver inlaid decoration. Late 19th c. to early 20th c. Mfg by: Tibet manufacture. Tibetan. 1 1/2" high x 2 3/4" wide. Steel case. Steel shackle. Silver & brass inlaid decoration. Late 19th c. to early 20th c. Mfg by: Tibet manufacture.